If you are like most people, your garage borders on chaos. Boxes balance precariously. Bikes, balls, golf clubs and more are shoved into any available corner. Tools and garden supplies are taking over one whole side of your garage. The car barely fits into the space that is left. The garage storage you do have just isn’t cutting it. The garage floor is stained and messy. The good news is, you aren’t alone! Most of our clients start out with a garage that is just not working for them. We know that you are busy and that organizing the garage is just one more thing on your to-do list — That is where we come in! A garage makeover can eliminate all of these issues. We start by taking a comprehensive look at your garage, then we work on designing garage storage solutions that will solve your problems. In this before and after example, you can see that we’ve tackled a variety of problem areas. On the garage floors, we’ve applied an epoxy garage floor paint eliminating unsightly oil stains and dirt. On the walls, we’ve installed one of our garage storage systems. This system allows sports equipment and bikes to hang on the wall, saving valuable floor space. 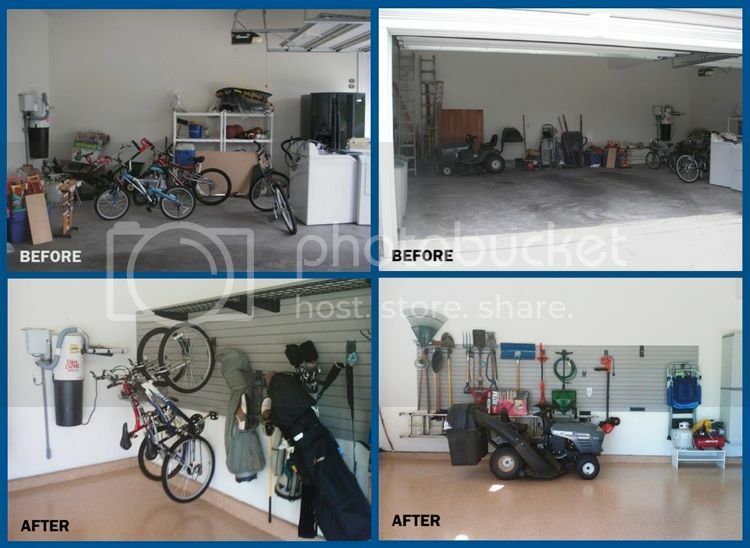 Garage shelving above the sports equipment provides space to keep less frequently used items. On the other side of this garage, we tackled the homeowners lawn maintenance and gardening equipment. Now rakes, shovels and the weed whacker are organized and out of the way. The lawn mower has its own spot and the same garage floor coating extends to this side and makes the floors shine. Hanging garage storage is a great way to keep your lawn tools organized. It’s time for your garage to go from before to after with a garage makeover. Call us today so we can get started on a custom garage solution for you. This entry was posted on Thursday, March 28th, 2013	at 9:56 am	. You can follow any responses to this entry through the RSS 2.0 feed. Both comments and pings are currently closed.